Here’s a film with magic as its central theme that can’t figure out how to trick us into thinking its funny. In what seems to be an ever-present staple in recent comedies, we are introduced to a young Burt in an extended opening. His absent mother leaves him a magic set for his birthday (along with a box of cake mix and instructions on how to bake it himself – that was kind of funny). He’s instantly hooked on magic and the star of the video in his kit, Rance Halloway (Alan Arkin). In short order Burt meets fellow outcast Anton and they dutifully get to work practicing their magic tricks. Fast-forward 30 years and Burt and Anton are successful headliners playing to full houses in their own theater at Bally’s Las Vegas. This timeline confused me a bit. I understand we’re supposed to see their act as becoming passé, but they are still performing to cheering crowds in what is supposed to be present day even though their act includes velvet suits and cheesy showmanship that would’ve been past its time in the ‘80s. 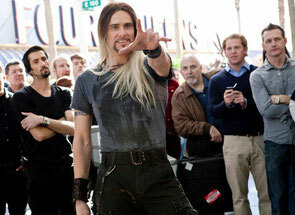 Confusion also is rampant in the type of comedy The Incredible Burt Wonderstone wants to be. It begins as an absurd Will Ferrell-esque farce (they even lift the “Cirque du So-Lame” joke directly from Blades of Glory), but that tone is dropped and then revived when convenient through the rest of the movie. One day Burt is introduced to the Criss Angel-like street magician Steve Gray, played by Jim Carrey who is far and away the best thing in the film. Carrey is funny and ridiculous in a return to form. It’s just too bad the film wasn’t about him and instead we’re left following an uninspired Steve Carell as Wonderstone. From one day to the next, Wonderstone’s audience shrinks, he and his partner split and he’s unceremoniously relieved of his duties at Bally’s. It’s quite a slog spending time with this character as he tries to adjust to his new lot – he’s stoic and wooden, probably by design, but there’s no nuance in the Carell performance and there isn’t anything in this character for us to latch on to. A scene of him performing magic at a Big Lots sounds like it would have potential, but is just yet another thing in the film that falls flat. More potential is offered up in Olivia Wilde’s character of Jane – a behind-the-scenes worker on Wonderstone’s show forced into the position of on-stage assistant. Wilde tries admirably, but her role is a thankless one that inevitably sidesteps any interesting developments and hurls towards the obvious (and completely unreasonable) part of love interest. In his scenes with Wilde, Carell occasionally drops the Wonderstone aloof bravado and tries to come across as genuinely vulnerable. Problem is by this time it seems completely out of character and impossible to buy. You can even see some Michael Scott (Carell’s loveable yet completely clueless boss on The Office) come out as Wonderstone is recalling his tales from childhood. After realizing there hasn’t been any plot or real point of the film an hour or so in, the filmmakers give us a contrived climax – a competition to headline at a new glitzy Las Vegas hotel-casino owned by Doug Munny (James Gandolfini), Wonderstone’s former boss at Bally’s. Of course this will pit Steve Gray against Wonderstone and his team. At least one thing remains consistent in this sequence – Carrey is hilarious and the rest of the performers are not. At the end of the film when we see the execution of Wonderstone’s final illusion, it doesn’t elicit laughs at its ridiculousness, it just comes off as embarrassing and mean.